The Asus Rog Strix GL753 isn’t the best-looking laptop on the market but it is comfortable to use and ideal for average gaming. It’s constructed with a plastic chassis with neon orange touches. The display is a matte FHD with vivid colors and sharp details but, being a budget version, it isn’t as bright as some of its predecessors. It does have a decent range of viewing angles though. There are several ports – Ethernet, HDMI, MiniDisplay, headphone jack, 3 x USB 3.0 ports, 1 x USB-C and 1 x USB 2.0. There is a lock slot and an SD Card reader included too. The audio is powerful for a laptop, offering great sound even at full blast. The keyboard is comfortable to use with 2.1 mm travel and RGB backlighting – they keys are red out of the box but can be changed using the Rog Aura Core software. The touchpad is fairly accurate and responsive to multi-touch gestures but clicking might cause a problem – a gaming muse may be a better option. 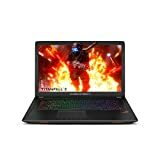 As a gaming laptop, it offers an NVIDIA GeForce 1050 GPU with 4 GB dedicated RAM – don’t expect it to play intense titles too easily though, especially on high settings. An Intel Core i7 2.8 GHz processor provides the power, coupled with a 256 GB SSD drive and 16 GB RAM and battery life averages outa t around 5 hours. Ideal for average gamers, the Rog Strix GL753 is affordable, comfortable to use and not bad in terms of performance.